Individual Industrial Technologies training modules may be taken by anyone interested in the specific topic. 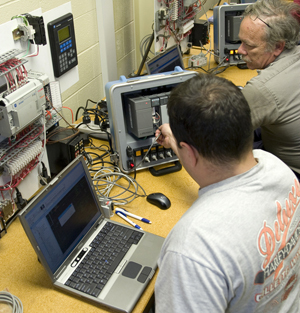 You do not have to be enrolled in a full time Industrial Technology program to enroll. On completion of a module, students receive a WCCC Certificate of Completion. Contact the Program Coordinator prior to enrolling: 513.933.3938. • Each class is a self-contained training module in which hours vary (see list of Module Categories below). • Cost: varies per module based on hours. Module fee does not include any related certification testing fees. • Class meeting times: 5:30-9:30pm, two to four nights per week. • Employers may slot individual employees into specific modules for new or upgrade training purposes. • Individual modules may be customized for corporate training programs. For details, schedules and registration information contact the program coordinator: 513.933.3938.